Here are some other Pokemon collecting sites you might enjoy! If you'd like to link me on your site, send me an email at happyjolteon at gmail dot com. Pkmncollectors - the community with all those other great collectors! If you're into Pokemon collecting, you should definitely check out this community. Sunyshore has the largest Raichu, lion, and electric collections you will ever see! Also home to the great Sunyshore Pokemart with many excellent Japanese items. CollectorViper is my friend Callyfin's Pokemon TCG collection, scan, and news database. Check it out for the latest card news and great card scans! Hanten Sekai features an extensive collection of both formes of Giratina! She also has a site for ghost-type Pokemon and many other collections here. Distortion World is a collection site for Dialga, Palkia, Giratina, and Arceus. It's always great to see another Dialga collection! The Littlest Samurai houses Tamago226's very extensive collection of Mijumaru/Oshawott, and also his evolutions! VS CARDS & AMADA STICKERS ALL THE WAY!! !, as you may guess, is dedicated to VS cards and Amada (Retsuden) stickers. Nmtr37 is working on scanning all of these cards and stickers individually to create a very interesting collection site database. Since these cards often have unique artwork, you may find your favorite Pokemon in brand new poses here! SlothyShroom is a site showing collections of the Slakoth and Shroomish evolution lines (sloths and shrooms!) but features a few other Pokemon as well. Sacred Field is a collection site for the Legendary Beast Trio (Entei, Raikou, and Suicune), as well as Absol. グラシデアの花 is a collection site dedicated to Shaymin's Land Forme merchandise, also maintained by the owner of Sacred Field. Sorjei's Collection Site is a collection that doesn't focus on a few single Pokemon, but rather items that she especially likes. Check it out for a variety of Pokemon! Sealed Chamber focuses on Kaiyodo collections, that company that makes the Pokemon prerelease figures, Trading Figure Game, bottle cap figures, and more! Why do I collect Dialga? (This is actually minus the special DS, but other than that, this is all I had at the time.) A few months later it outgrew the table, then a shelf, then two shelves, and now I have a hard time getting everything visible in one picture. If you have questions or comments about the site, or Dialga stuff you know about that I don't, you can email me at happyjolteon at gmail.com (with the @ put in if you're not a spammer). LiveJournal's pkmncollectors community. You probably aren't asking this if you came to this site from there, but it's a haven for people like me who enjoy collecting and sharing their collections with others (whether that means selling, trading, or just showing off). A lot of the Sources listed for these items are Yahoo! Japan. Once I had exhausted eBay, pkmncollectors, and local retail stores for readily available goods, I bought most of the other stuff on Yahoo! Japan using a deputy service (Shopping Mall Japan). I'm not using SMJ anymore due to poor quality of service and fees I encountered, but that is how I got quite a lot of the stuff I have now. I now use a private deputy service primarily, but also back up with Noppin (formerly Crescent Shop). Of course, I'm always still checking eBay, pkmncollectors, and those local stores for more Dialga things, as especially on pkmncollectors there are always new sales going on. I've also been to Japan a few times and picked up many additions for my collections there. Where did you get that giant Suicune? It's not a focus of the site, but since I've gotten several emails about it I'll add it here. After missing the opportunity to buy the plush on the US pokemoncenter.com website (which is now closed), I got it several years later after a heated bidwar on Yahoo Japan auctions. She seems to show up for sale about once every year or so, but usually goes for at least $500, so it's best to save up if you're looking for one! The Dialga items are not for sale; the Jolteon items may go up for sale eventually. 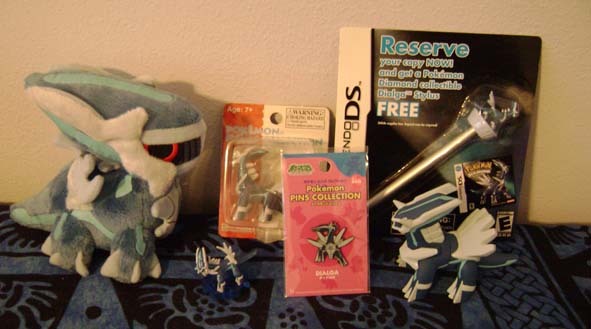 I do sometimes get extras of a few Dialga items, so feel free to email me and ask, but please don't be upset if I only have one and won't be selling it. I've already sold much of my non-Dialga, non-Jolteon collection and have left it here for reference, but I may still have some items left. Do you collect anything with Dialga? Not exactly. There's a lot of stuff out there that has Dialga and Palkia (or Dialga and Darkrai or Giratina) half and half. I can't really call these Dialga items, so I don't count them as part of the collection really, but if I happen to have them I may still include it here. If something comes with a bunch of Pokemon though, and I can take the Dialga and make it an individual item, I'm all for it.